When we use a CPAP for sleep therapy, we learn that one of the most important things that we can do for our machine and ourselves is to keep our masks cleaned entirely and sanitized. There are so many medical reasons to make sure that we are sanitizing our face masks appropriately. Without proper cleaning bacteria, mold, fungus, and other unwanted contaminants could build up in the CPAP mask or tubing and cause us to get sick as well as these particles could cause unwanted odors. The problem with needing to keep the CPAP mask clean is that washing it by hand can be messy and time-consuming at its best and inefficient and unreliable at its worse. Sinks full of water, solvents, bottle brushes and more cause the disinfecting your equipment by hand a big mess. Not only does the hand cleaning process take time and precision to make sure that you are reaching all of the hard to access nooks and crannies, and it also takes a long time to let all of your equipment to dry after that process. It can take over an hour for the washing, and it could be more than three hours before any of your gear is useable again. I know this chore can seem daunting and due to the difficult cleaning process, often the task of sanitizing masks does get neglected. There is no need for skipping the cleaning process any longer. With the invention of a CPAP Mask Cleaner, you can relax and let an automated system simplify the process to a few clicks of a button. Three of the leading brands on the market are VirtuClean, Lumin, and SoClean. These devices take only minutes to complete the sanitization process, provide reassurance that your mask and gear are germ-free, as well as offer the convenience of immediate use after disinfection is complete. With there being over 50 various types of masks available today, it can make you worry if you were to get a specific device for cleaning your CPAP equipment if the CPAP mask cleaner would be up to the task of disinfecting your brand. The VirtuClean, Lumin, and SoClean can all clean almost all varieties of the brands and variations of masks that are on the market currently. With each device’s unique style of sanitization, they can adapt or adjust to work with the differences in shape, size, color, and material variations. Despite the fluctuations in the construction of the different head gears, regardless of the varieties of facial coverage causing the masks to range in sizes, even with the array of hose hookups available on the different CPAP masks, these three leading CPAP mask cleaners were designed to clean them all. The VirtuClean, Lumin, and SoClean were created to provide a simple, convenient, and effective way to clean almost any CPAP mask that you might have. Seven different companies produce all of the multiple styles of masks. Each of those manufacturers will have their own specifications for how to clean their particular CPAP masks. Some of those cleaning instructions will include solvents, solutions, or specified wipes. All of those tools are useful and can help you with your CPAP disinfecting needs; however, with the added convenience brought to you by the VirtuClean, Lumin, and SoClean, you can sanitize your equipment every day with ease. This way you are sure to get the best clean possible allowing you the peace of mind of knowing that over 99% of any contaminates are eradicated right before you sleep at night. Each of the three main CPAP mask cleaners works in different ways. They all have their own benefits and conveniences. They are very comparable to each other. You can choose which on of these devices is best for you by looking at how each of them sanitizes your personal equipment. 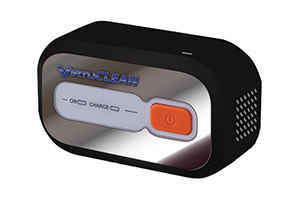 The VirtuClean CPAP mask cleaner device is a small device that is easily accessible and able to travel with you to help you maintain a sanitized sleep on the go. This machine can be easily stowed in a small bag or tote along with your CPAP to help you have the peace of mind of knowing that even while you are on vacation or away from home that you can still be getting the best and most hygienic sleep possible by daily use of the VirtuClean. Despite the small size of the VIrtuClean, it still can disinfect your CPAP mask, tubing, headgear, and water reservoir every day. It will kill more than 99% of all the germs, bacteria, molds, viruses, and fungi that might be living in your CPAP equipment. The VirtuCLEAN works by using a two-step process. You do this step by disconnecting the tubing from your CPAP machine and placing then end with your mask and headgear into the bag that came with your VirtuClean. You leave out the end that you unhooked from the CPAP and connect that end to the VirtuClean device. 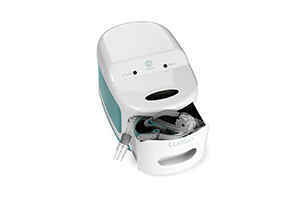 You turn the CPAP mask cleaner on with the press of a button and let it go through its 30-minute disinfection cycle. After a brief 5-minute air out cycle, your equipment is ready to be used. You should sanitize your mask daily. Step 2 Sanitizing your water reservoir. This step starts by emptying your humidifier chamber of water and wiping it dry and placing it back into the CPAP machine. Next, you will want to disconnect the face mask and headgear from the end of your CPAP tube. Now you will connect that end to your VirtuClean device. You turn on the VirtuClean and allow it to go through the sanitization cycle. You should sanitize your humidifier reservoir at least once a week. During those two steps, the VirtuClean pumps ozone into the hose which then cycles through the tubing into the chamber created by the bag or into the water tank. Ozone is oxygen that has been transformed by adding an extra oxygen molecule making it activated oxygen. Unlike regular oxygen when is safe to breathe and essential to much of life on earth, activated oxygen is not more hostile, and in the right concentration, it can create an environment where nothing can live. That is how the VirtueClean can sanitize your equipment so thoroughly. The VirtuClean device pumps ozone into the chamber until the concentration is high enough to eradicate all of the germs and unwanted contaminates. 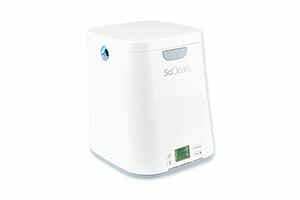 The SoClean CPAP mask sanitizer is an all-inclusive machine that works by cleaning your CPAP equipment on a fully automated process. The device its self is made to set on the same surface as your CPAP machine. Because of the nature of how the SoClean utilizes your equipment to help it sanitize, you do not need to disconnect any of the tubing or hoses for it to work. Unlike the other CPAP cleaning devices on the market, the SoClean does not require any disassembly of your CPAP gear. All that you will need to do is place your CPAP mask and headgear into the chamber. Next, you close the lid and press the start button. You can watch the cycle lights that indicate where the device is in the disinfection process. When the sanitization is complete, you will be able to immediately use your completely dry and germ-free mask as well as enjoy the knowledge that all of your gear has been disinfected. Comparable to the VirtuClean, the SoClean utilizes the cleaning power of ozone. The chamber that you place your CPAP mask in fills with activated oxygen pushing it down the tubing and into your water reservoir making sure to sanitize all of the surfaces in your equipment. This process ensures 99.9% illumination of all harmful particles and reassures that you are getting the healthiest CPAP therapy available to you. The Lumin CPAP mask and accessories cleaner is a larger device that houses a fail-safe UV light chamber. The device itself has to be large enough to house most CPAP masks with their headgear and humidifier reservoir. The unit can set on your bedside table or on a shelf where you feel comfortable taking your equipment to go through the sanitization process. Cleaning your CPAP mask with the Lumin is a quick one-step process. First, you disconnect your CPAP tubing from the CPAP machine and place the hose and your CPAP mask as well as the headgear into the chamber of the Lumin. Next, you will disconnect the water reservoir from your CPAP machine and empty it wiping it down to dry it off. You will then place the humidifier tank into the Lumin’s light chamber. Now you will close the chamber and press the start button to begin the sanitization cycle. In just five short minutes your CPAP mask and all of the accessories will be disinfected and ready to use immediately. Unlike the VirtuClean or the SoClean, the Lumin does not use ozone or activated oxygen to sanitize your equipment. The Lumin utilizes the disinfecting power of Ultra Violet (also known as UV) light instead. UV light is a spectrum of light that is in the sunlight at lower levels. When these levels are concentrated or focused in one area, the powerful beam affects organisms on a cellular level stopping the ability to reproduce in an organism’s DNA. By utilizing the UV light’s ability to end life on such a microscopic level, we can sterilize all sorts of different items. Scientific labs, dentists, and even surgical and medical teams use this type of disinfecting on their tools and equipment. The Lumin uses high powered UV light inside of the failsafe chamber to sanitize your CPAP mask, headgear and tubing. It can kill over 99% of the bacteria, mold, fungus, or viruses that can be in your CPAP equipment. The Lumin CPAP mask cleaner can serve multiple purposes outside of just CPAP machine accessory sanitization. By placing other items into the Lumin’s UV light chamber, you can disinfect them as well. Eyeglasses, toothbrushes, and hearing aids are just a few examples of other items that would fit into the sanitization chamber of the Lumin. As designed, the Lumin does not need any replacement parts or new light bulbs. The bulbs can be replaced if needed but were made to last the lifetime of the Lumin. Though the Lumin CPAP mask cleaner does disinfect all the areas in the chamber, if any debris got into the light tray you would want to wipe that area down with a soft cloth. The trouble with getting your CPAP mask clean is that there are many areas that germs and bacteria can build up. That is why there was a need for the invention of the CPAP mask sanitizers. Even with the disinfecting power provided by a CPAP mask cleaner, there is still the potential for particle build up on the headgear and face mask its self. Even with the daily cleaning using a sanitizing device, you will, on occasion, need to use a damp cloth or wipes recommended by your CPAP mask manufacturer to remove any facial oil, hair, or debris build up for the outside of the equipment. Regardless of the gear being entirely germ-free, the ozone or the UV light cannot remove the fragments that might be on your mask from making contact with your face and hair. If you wipe down your CPAP’s mask and headgear as well as utilize the sanitizing powers of the VirtuClean, SoClean, or Lumin, you will be able to sleep well knowing that your CPAP equipment is clean, and your breathing environment is healthy and a hygienic. With these steps, you are getting the most out of your CPAP therapy, and that should offer you a little peace of mind while you rest.